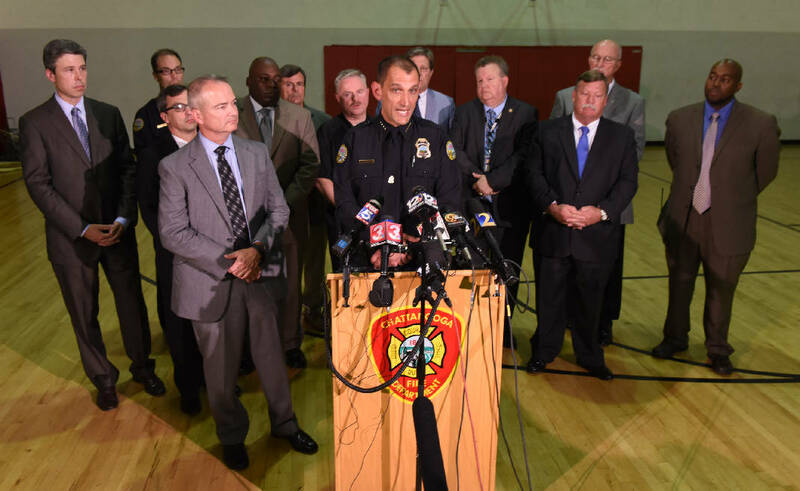 Chattanooga Police Department Chief Fred Fletcher speaks from the podium during a news conference at the Chattanooga Fire Training center about a domestic terror incident that killed four Marines at the Naval Reserve facility on Amnicola Highway on Thursday, July 16, 2015, in Chattanooga, Tenn. There are still many questions to answer about the shooting events that happened in Chattanooga on July 16. But, here's a list of questions and answers to help clarify what we know so far. Q: How many shooting sites were there? A: There were two sites. A single shooter opened fire at a military recruiting center on Lee Highway from inside his convertible. When police responded, he led them on a high-speed chase to another military installation on Amnicola Highway, where he opened fire again. Q: Who were the Marines who were killed? A: Officials recently released the identities of any of the victims in the case. They are Staff Sgt. David A. Wyatt, Sgt. Carson A. Holmquist, Gunnery Sgt. Thomas J. Sullivan and Lance Cpl. Squire K. "Skip" Wells. We will update our coverage of the heroes as we get more information. Q: How did the shooter die? A: Investigators have not released any details on how the subject died. Q: Was it a terrorist attack? A: U.S. Attorney Bill Killian said he considered the case "domestic terrorism." However, officials have yet to explain what that means or how it applies in this case. However, the chairman of the U.S. House Homeland Security Committee said Friday taht the FBI has officially opened Thursday's slaying as a terrorism case. A: Unlikely. Many have pointed to a tweet from a Twitter account some say is affiliated with ISIS. However, the timestamp on that tweet indicates that it was sent two hours after the attack, not before. The FBI has also not been able to find any link to ISIS. Q: What counts as a terrorist attack? A: The Federal Bureau of Investigation defines "domestic terrorism" as life-threatening acts inside the U.S. that appear intended to intimidate or coerce a civilian population, influence government policy, or otherwise affect the conduct of government through mass destruction, assassination or kidnapping. Q. What was the suspect armed with? A. The FBI agent in charge of the case would not say what weapons Abdulazeez used, but did confirm that he had "multiple weapons." Q: Was Bradley Square Mall involved in the events on Thursday? A: No. A "shots fired" call went out and police responded to the mall, but found that no shots had been fired and there was no shooter present.